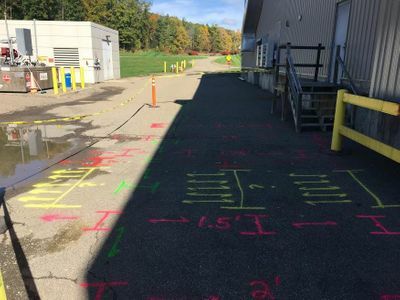 Ground Penetrating Radar Systems, LLC was contacted to locate all underground utilities at a site in Painted Post, New York. The client was planning to pour a foundation for a set of steel stairs. The client needed to know where all utilities were, the path of each line, as well as the depth of any utility located in the proposed area. We started our investigation using our Radio Detection wand to identity any live power signatures. We then perform grid pattern scans with our 400MHz antenna to identify any anomalies beneath the black top surface. Finally, we traced and mapped all anomalies to a source to be identified. If an anomaly could not be identified it was marked as “unknown”. At this site, we located five separate gas lines, a sewer line, an electric line, as well as several unknown anomalies.